Transform boundaries occur where the Earth’s tectonic plates slide past each other horizontally along transform or strike-slip faults. Unlike divergent (constructive) and convergent (destructive) plate boundaries, lithosphere at transform boundaries is neither created nor destroyed deeming them “conservative” plate boundaries. Instead, due to the relative motion of the plates being parallel to and in opposite directions across the fault, the plates slide past each other laterally. Transform boundaries can be dextral (right-lateral) or sinistral (left-lateral) with fault planes near vertical or dipping steeply in one direction. As shown below, a person standing on one side of a right-lateral strike-slip fault will watch a tree on the opposite side move right as the fault slips. Similarly, if the same situation occurred and the fault was left-lateral, the tree would move left. Transform boundaries occur all over the world and come in many shapes and sizes. 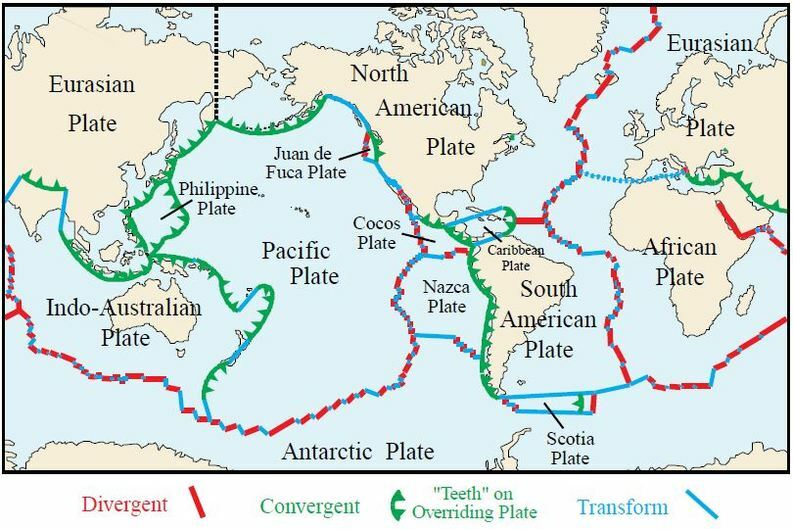 As shown in the map below, they are particularly common along divergent plate boundaries where they connect sections of oceanic spreading centers or mid-ocean ridges, helping create some of the longest topographic features on the planet. Transform boundaries also form on larger scales on land like the San Andreas fault in Western North America and the Alpine fault in New Zealand. Like all plate boundaries, the movement of crust along transform and strike-slip faults creates earthquakes. Earthquakes associated with transform boundaries are relatively shallow occurring at depths of ~0-20 km beneath the surface. Mountains, basins and unique topography can form along transform boundaries depending on the fault’s geometry, the rock type and how parallel the motion of the plates are to the strike of the fault. Below we’ll describe some of these features in more detail and take a look at some examples of transform boundaries from different locations around the world. What Do Transform Boundaries Form? As mentioned above, fault geometry plays a big role in forming topography along transform boundaries. In particular, bends along strike-slip faults can form both basins and mountains. A bend can be “right” or “left” depending on which way the fault turns if you were walking along strike. 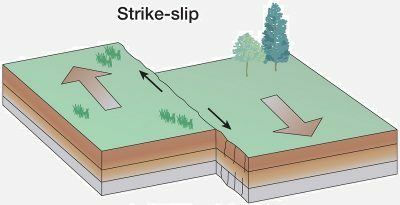 As shown below, a right bend in a right-lateral strike slip fault (or a left bend in a left lateral strike slip fault) is called a releasing bend and results in extension which in turn can form normal faults and pull-apart basins. In contrast, a left bend in a right-lateral strike slip fault or a right bend in a left lateral strike slip fault results in compression which can form thrust faults and mountains. While restraining bends can form high mountains, releasing bends create low points on the landscape where sediment and water from rivers and oceans can flow in. Fractures, normal faults and cracks in the basin also allow water to come up from the underneath the surface forming springs. If the water reaching the surface comes from depths deep enough to have been heated by the Earth, hot springs can form! 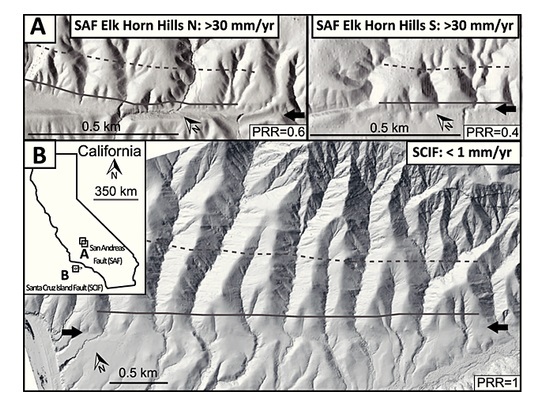 Other geomorphic features that accompany terrestrial transform boundaries are linear fault valleys and offset streams. Linear fault valleys can form along strike-slip and transform faults as rocks get ground up during movement and slipping. Overtime, this weakness provides easily erodible material for rivers and wind to transport away creating huge scratch like features on the Earth’s surface. 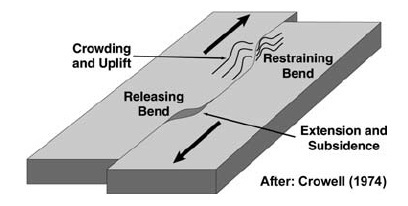 Streams that run across transform or strike-slip faults may slowly get offset over time as the fault moves and slips as shown in the images below. The San Andreas Fault, pictured below, is a well-known right-lateral transform boundary that runs much of the length of California’s west coast separating the North American plate to the east from the Pacific plate to the west. Starting in the Gulf of California, the San Andreas picks up where the East Pacific Rise spreading center leaves off. 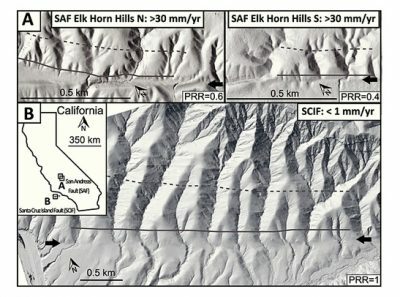 Moving into southern CA, a slight right bend in the fault creates a pull apart basin allowing for the opening of the Salton Sea. As the San Andreas makes its way into the greater Los Angeles area, it takes a left bend uplifting southern CA’s highest mountains, the Transverse Ranges. 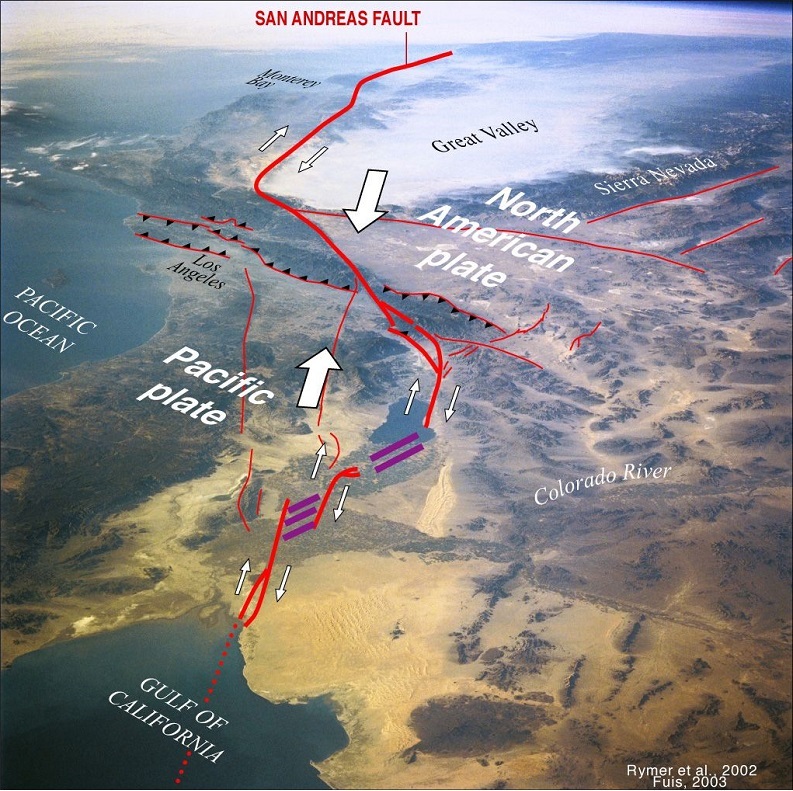 Unlike southern CA, the central portion of the San Andreas does not experience many earthquakes in large part due to the presence of serpentine minerals in the rocks beneath the surface. Serpentine, which happens to be CA’s state rock, consists of a group of soft, slippery minerals which allow the crust in this region to slide continuously without the buildup and release of pressure associated with more brittle, stickier rocks. Before heading offshore to its termination at the Mendocino triple junction, the San Andreas makes a stop in San Francisco where it shook the city violently in the 1906, magnitude 7.9, San Francisco Earthquake. 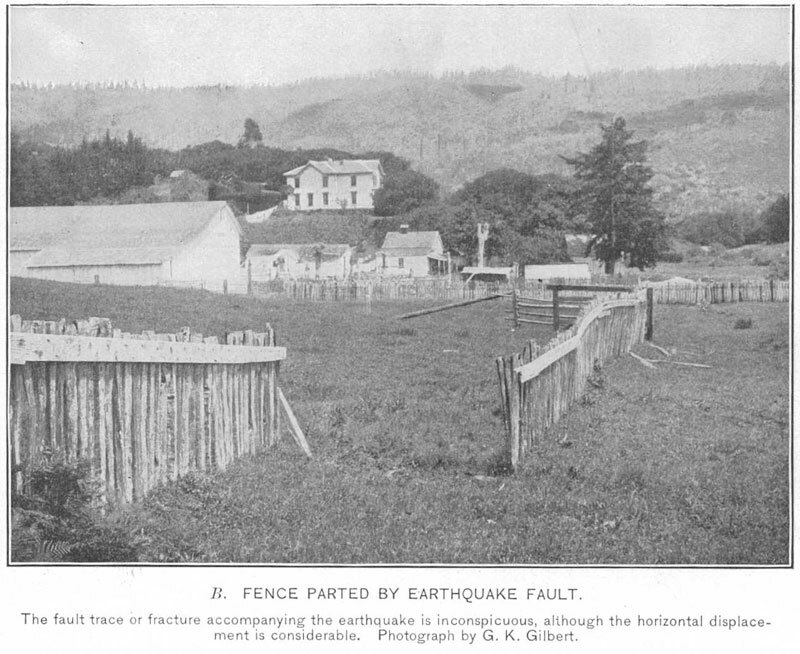 As shown below, fences offset by the fault during this quake provided a visual explanation to what was happening beneath the surface. Sadly, destruction from this quake created fires that burned many buildings in San Francisco and killed hundreds to thousands of people. Thanks to oblique convergence between the Pacific and Australian plates, New Zealand is home to several kinds of transform boundaries. On the South Island, this has resulted in the right lateral, oblique, Alpine fault. 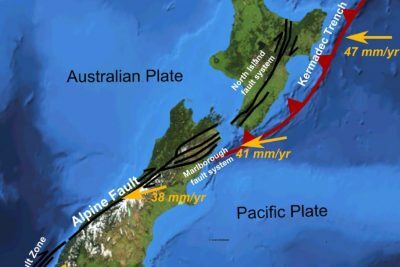 Since the Alpine fault lies at slight angle to the plate motion vector and is dipping to the southeast, some convergence occurs across the fault and uplifts the Southern Alps mountains, including Mt. Cook, the highest peak in New Zealand. 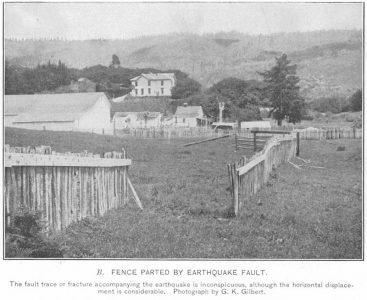 On the North Island, oblique convergence between the plates has resulted in not one kind of fault but two. While the east coast Hikurangi subduction zone accommodates a large portion of the plate convergence, the inland North Island fault strike-slip fault system accommodates the lateral motion between the plates. At the transition between the Hikurangi subduction zone and the Alpine fault lies the Marlborough Fault system, an interesting and complex transform boundary zone with not one right-lateral strike slip faults but four! Collectively, oblique convergence across Marlborough, along with the translation of crust onto the underlying pacific slab results in uplift of the Kaikoura mountains and marine terraces along the coast. 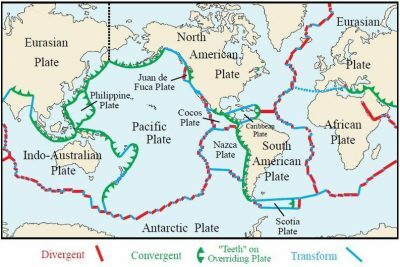 Mid-ocean ridges or oceanic spreading centers are underwater divergent plate boundary zones where new lithosphere is being created from the upwelling of magma beneath the surface. These spreading ridges are often connected by transform faults in large part because magma coming toward the surface is 1) not always coming up in a perfectly straight line; 2) not always surfacing at the same time and 3) not always occurring at the same rate. To accommodate these differences in lithospheric generation, fractures form at the surface and transform faults form between the spreading centers like in the image shown below. 1. What is another name for a left bend in a left lateral strike-slip fault? 2. What type of earthquakes occur at transform boundaries? 3. What is another name for a transform boundary? @2018 - scienceterms.net. All Right Reserved.